Well known dj & promoter from Ukraine Vadim Weiss under new alias Hector Cooper. He has started career in music business as a DJ and club promoter in the middle of 2000's. His promo-group & booking agency Ganesha Promo quickly became a leading event company in Eastern Ukraine's club scene and made a huge contribution to the development of electronic music in this region and Ukraine in general. He gained a good attention as a DJ and vinyl collector touring across Ukraine and Europe with hits sets. Working with the artists from around the world as a promoter and booking manager Vadim always wanted to release his own music. The year of 2014 brought the big changes. 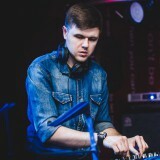 Vadim took himself a new artist name Hector Cooper and became a co-founder of record-label Vesna Recordings. His first solo EP called "Solid Jackin" came out on Vesna with remix from another well-known Ukrainian producer Volta Cab. Also his remix on The Maneken's "Keep Moving On" which been played by many DJs and radio-stations made his name recognizable. Now Hector Cooper have a numerous new tracks and EP's waiting for release on different labels, so keep an ear on this guy!